Int'l Law & Criminal Law Dep. This French advisor, politician and economist devoted his work to European integration. As a staunch supporter of a united Europe, he was the major inspirer of the Schuman Declaration leading to the creation of what is considered to be the germ of the European Union: the ECSC (European Coal and Steel Community). 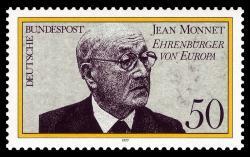 Due to the great influence of his personality on the consolidation of a united Europe, Jean Monnet is considered to be one of the fathers of the EU. "We are building union among people, not cooperation between States"